As many of you know, we are restoring an 85+ year old house. One of my favorite features of the house is the back patio area. It has a huge pecan tree shading it, which will be great in the Texas heat. The whole area is in sad shape now, but I have big plans for it. I've been dreaming of all the wonderful get togethers we can have out there; I think the cold has me yearning for warm weather. I've always wanted a fire pit in the middle of our patio area. I can just see us entertaining on summer evenings around the warm glow of a fire. 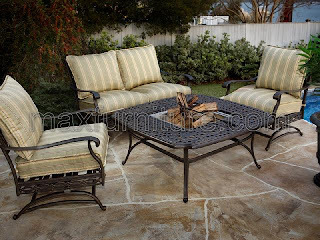 I want to surround the fire pit with a lovely set of patio furniture, basically making it into an outdoor living room. I love the look of this set. 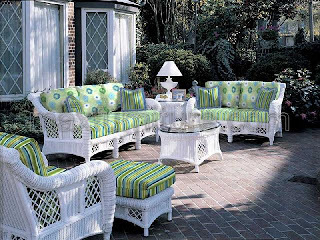 I also love the look of wicker furniture. It has a charming feel, reminding me of days gone by. I would love to have this beautiful set on my front porch. But, it is still winter here, so I have to content myself with drooling over all the beautiful furniture offered by Max Outdoor Living. I sit here, browsing their website, making plans, and dreaming about warmer weather. I cannot wait to throw our first BBQ bash under that big old pecan tree! I think you did a great job of "dreaming" about warm weather. I love the furniture. You might want to stock-up on some citranella oil for that fire pit. Just saying. Unless you live in a part of Texas where there are no mosquitoes. Haven't been there yet - and I've seen a lot of Texas. chkl. You have an excellent point! The mosquitoes just about carried us off last year! Maybe we need a giant bug zapper on the back patio. Nope. Bug zappers do not draw mosquitoes - only the kind of bugs you might like to keep. Citranella, I'm telling ya. You can put candles or tiki lanterns with the oil around the perimeter and it will help clear the area of mosquitos. Worst times are dusk and dawn - when they come out to feed. Other natural solutions - bats - put up a house and hope they find it. And Purple Martins - put up a house - in February - and hope the scouts find it. The fire by itself will help. Also, do not leave standing water anywhere in the yard - like pet water bowls. But you cannot control the water 6 feet away in your neighbors yard. Truthfully, I started using the yard fogger products last summer and it freed me! A quick spray before I mowed or got in the pool (no problem with chlorinated pools usually).